Hi Crafty Friends! I’m Lyne from Lynn’s Every Day Ideas, and I’m pleased to make your crafting acquaintance. I want to start with a big thank you to Pam for having me on the blog today. This is my first guest post ever…how exciting! So, let’s get down to why you’re really here with me today. You want to see what I created or learn something new right!? Well, today I created a wedding scrapbook layout to share with you using nothing but scraps, and I’m talking tiny scraps. Many moons ago I subscribed to an awesome scrapbook club that sent you papers and sketches each month. They did a wonderful job of using every scrap of paper they could to create double page layouts. I wanted to challenge myself though to use the tiny pieces left. Look what I created! The Winter Frolic Cricut Cartridge is perfect for the cold chilly months. With lots of snowmen, winter critters, and kids skiing and playing in the snow you will have lots of fun die cuts for your snow Cricut Projects. The list of great shapes doesn’t end there though. There is a wide variety of Christmas die cuts including Santa, presents, and all the animals and characters to make a nativity scene. This awesome layout using the Winter Frolic Cricut Cartridge was designed my Crafty Ladybug. Visit her website Crafty Ladybug Creations. My friend, Kim with Day to Day Adventures is here today with ideas for Simple Scrapbook Ideas. Sometimes, when we’re making scrapbook pages, we feel like we will never get caught up! Kim has some ideas for pages that you can do quickly that use lots of pictures. Hi, I’m Marie Dabbs from The Inspiration Vault. 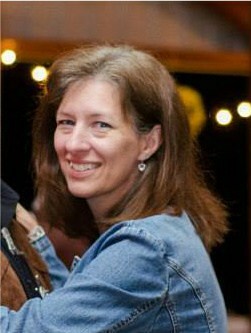 I’m lucky enough to call Pam my friend and I’m thrilled to be writing a guest post for her and P.S. I Love You Crafts. We’ve often discussed how much we both love nautical crafts, so I knew I had to make this Nautical Cricut Scrapbook Layout for her. Now Pam has another layout to add to her Beach Scrapbook Layouts. I’m a huge fan of Target’s dollar area at the front of their stores, and last month I found some very cute nautical-themed craft supplies. I’ll be using some of those for this layout. When I think nautical, I think anchors, flags, rope, and compasses. For the compass, I used my Cricut Edge to Edge cartridge. I love that you can adjust the sizes of all of the images to suit your needs. I also used the Create a Friend cartridge to make the “AHOY” cut, but you could always make one yourself in Design Space. Nautical Embellishments – I used anchors and jute. Cut the compass die cut in half vertically. Attach it to the teal pages with the straight edges in the center. Cut six, 8-inch pieces of jute cord. Fold 2-inch pieces of the washi tape in half over an 8-inch piece of jute cord. Clip them with scissors so they have a ribbon bottom. Attach the other nautical embellishments to an 8-inch piece of jute cord. Attach both jute cord pieces to the top outside corners of each page. I put the washi flag on the left. Attach the other four pieces of jute cord to the outside bottom corners in loops or knots. Adhere the 2-inch white circle behind the lifesaver in AHOY. Attach the AHOY cut to the left side below the washi flags. Adhere the pink photo mats as shown, two on each page. I hope you enjoy making this Nautical Cricut Scrapbook Layout. I absolutely love making paper crafts with my Cricut. Be sure to stop by The Inspiration Vault to see more of our Cricut projects and see the special gift I made just for you. If you like this Nautical Cricut Layout, take a look at Scrapbook Pages Ideas for more ideas. Hi, I’m Marie. I have had a passion for crafts my whole life. Over the years and after three kids involved in Scouts and other activities, I discovered my other passion, event planning. I love making my own decorations and styling rooms for parties. I’m at my happiest when I can combine crafts and party styling. It’s so much fun! Yes, I know this isn’t the right time of year for Cricut Christmas Scrapbook Pages. Let’s take a poll though….raise your hand if your scrapbooks are caught up, and you actually scrap your Christmas photos in December. Uh huh…see….that’s what I thought! Most of you are still doing Christmas photos from 2008, so posting a Christmas Scrapbook Page now isn’t such a bad idea! And besides, you can change the papers and die cuts and have a layout for a different occasion! Many people ask me about how to make a scrapbook album. For nine years I lived and breathed scrapbooks. My life revolved around scrapbooking, paper, and stickers. I owned a small scrapbook store which I closed in August 2011. For those nine years, I taught many people how to make a scrapbook album, how to use the Cricut, and how to make cards. A scrapbook page with a Cricut squirrel isn’t just for fall. With all of the projects that I have on this site that feature the Create A Critter Cricut Cartridge, I’m sure you’ve already guessed that it is one of my favorites! You may usually think about squirrels being a fall animal, but here in Maryland, they are spunky all year long. This Cricut Scrapbook page looks more like spring or summer with the bright green and leafy tree and tree branch. One 12×12 piece of patterned paper or solid cardstock for the background. I used a green dotted paper from Stampin’ Up. I really like using something with a small pattern or a texture for the background of scrapbook pages. 11″ x 4″ piece of patterned paper (trees). 1 1/2″ x 8″ piece of patterned paper (pink floral). Even though there is a little bit of pink in this scrapbook page, I think it could still be used for a boy. 4 1/2″ tree from the Create A Critter Cricut Cartridge. Save some of the cut out leaves for the tree branch. If you have trouble choosing adhesives, visit Cardmaking and Scrapbooking Adhesives to learn about the different kinds and how they are used. After you have cut the layers for the Cricut Squirrel, Owl, Tree Branch, and Tree, attach all of the pieces using a glue pen and set aside. Using Scrapbook Adhesive, attach your patterned papers to the 12×12 background papers, following the photo above for placement. Attach the tree branch and the tree to the page using tape runner adhesive. Use Pop Dots or foam tape to “pop up” the Cricut squirrel and owl. Ta daaa! You’re done! This sweet Cricut Scrapbook Page is a pretty simple Cricut Project. All of the shapes are pretty big with only a little detail, making them easy to assemble. Create A Critter has lots of sweet animals that would go along with these. I hope you will try it out! If you’re interested in more Scrapbook Pages for little ones, visit Baby Scrapbook Ideas. Here are some more projects using the Create A Critter Cricut Cartridge. Cricut Explore Air – Save a Bundle! I got a Cricut Explore last year for Christmas, and I LOVE it! I have made signs, decorated mugs and cups, done glass etching, and created cards and scrapbook pages. It’s so much fun creating with the Cricut Explore Air! Want to be able to easily make pretty décor, personalized gifts, and fun cards for upcoming holidays? Then you need to treat yourself to a Cricut Explore Air™ — Cricut’s very popular electronic cutting machine. It’s the best DIY crafting tool to be developed since the sewing machine! The Cricut Explore Air is versatile, easy to use, and allows for very precise cuts. It’s also incredibly affordable, especially since Cricut generously discounted the cost by up to $200 on the machine and bundles — just in time for the holiday crafting season!